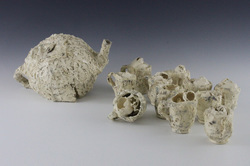 Tanya Kaiser is a visual artist specializing in ceramic sculpture. Born in Germany, raised in Ohio, and currently resides in New York. Her works examine decidedly female themes while exploring and at times challenging preconceived notions of beauty. She is especially interested in the cultural silencing of women’s suffering, due to the societal stigma associated with the female form. By directly confronting these issues through her artwork, she hopes that her pieces may serve as a vehicle for further discussion on women's roles, health, and bodily autonomy. Tanya received her MFA in Studio Art from Stony Brook University. In 2016 she was named the Goldberger Fellow for excellence in art. Her artwork in both 2D and 3D forms has exhibited internationally. Tanya Kaiser is an visual artist that examines decidedly female themes while exploring and challenging preconceived notions of beauty. She often uses botanical and female forms as catalysts in her work because of their shared symbology when representing subjects of fertility, beauty and life. Each piece is not pristine. One can see curled edges, deliberate punctures and patina finishes that show age. She is especially interested in the cultural silencing of women’s suffering due to the societal stigma associated with the female form; specifically the reproductive form. Through her artwork Tanya critiques and explores the relationship between politics and religion and how that relationship influences women's societal roles and reproductive health rights. By directly confronting these issues, she hopes that her pieces may serve as a vehicle for further discussion on women's societal role, health, and bodily autonomy.